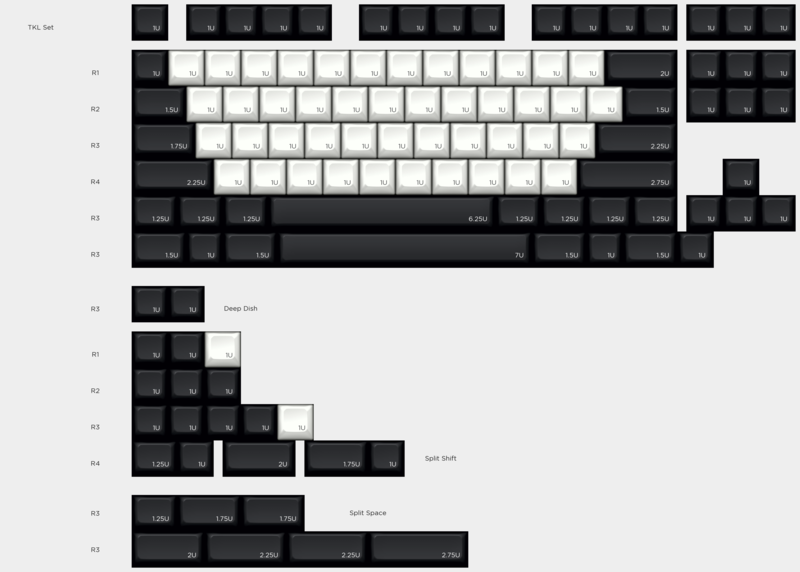 [GB] SA Bla_ks (Black & White Blanks) - Sorting caps. Caps are here, now I sort. After some confusion over the invoice, SP has confirmed production is started and 'should' ship out on April 11. Sorry for this delay. This means I'll likely ship in Late April / Early May (Shipping transit + 2 weeks sorting). Are you frustrated with so many symbols and legends on your keyboard? Are all the colors on your keycaps confusing you, blinding you, or making you nauseated? Do you know where the all the keys are anyway? Do you really wish you had some SA caps with split space, 40's, ISO Enter, and / or otho support OUT OF THE BOX? If you answered YES to any of the above, I HAVE THE PRODUCT FOR YOU: BLANK KEYCAPS!!!! Sculpted in 1-1-2-3-4-3: The most comfortable profile. Scientifically demonstrated. Black - NN, the same color as SA Pulse. White - WFK, the same color as SA Oblivion Hagoromo. I'd recommend the Shopify for US folks, and the Google Form for international folks (since a proxy can show up and make shipping 'different'). Invoices will be sent to forms folks when their kits all reach MOQ. You will have a week to pay, or I will cancel your order (and become annoyed at you). Shipping will be billed later for these orders. Jan 13: Orders close, Submit order to Signature Plastics for manufacturing. 1 week: Shipping to me. 2 weeks: Sorting / packing. That puts us around April 15th roughly for shipping. I'll be ordering extras for a lot of the kits. Looking like this will happen. Get your orders in! Sweet, I don't think I've seen a blank SA board that wasn't random crapbag caps. Can get a clean retro chunky board look with these. Send me a DM, I think I can give you some discount...? And cheaper than most SA sets, if I'm not mistaken. No numpad support?? Or am I too blind to spot them here? I work on it later today. Shouldn't be too bad. No one requested it in IC, so I didn't make the kits. Yep, color preference during IC was white, black, gray, all tied, pink second, and lots of other stuff after that. I just gotta make sure I'm not stretching myself too thin and understand the workload involved with a GB (or storefront). Added Numpad, $18, MOQ 15. Deep Dish Alpha Kit MOQ 5, $45. Made my selection, I suspect there may be too many kits though... The idea of an all homing alpha kit is interesting, I did six homing keys like on Realforce HiPro boards with my /dev/tty blanks. Really hoping this works out in the end though, I can never have too many high profile blank sets. I was thinking of combining bottom row kits, to force folks to buy both. But other than that (and deep dish alphas), where else do you see places to simplify? An "all mods and spacebars" kit? I felt like folks would be motivated by saving money on SA, which means buying exactly what you need. Shouldn’t the google form be set to allow u to edit your response? Or do u just Submit a new response to replace your old one then? You should be able to edit your responses. Typically, if I go back to a form it says I already filled it out, and there's a link to edit. Edit: or send me a pm and I'll adjust it. Well in past IC's for this exact idea there was always one big kit. 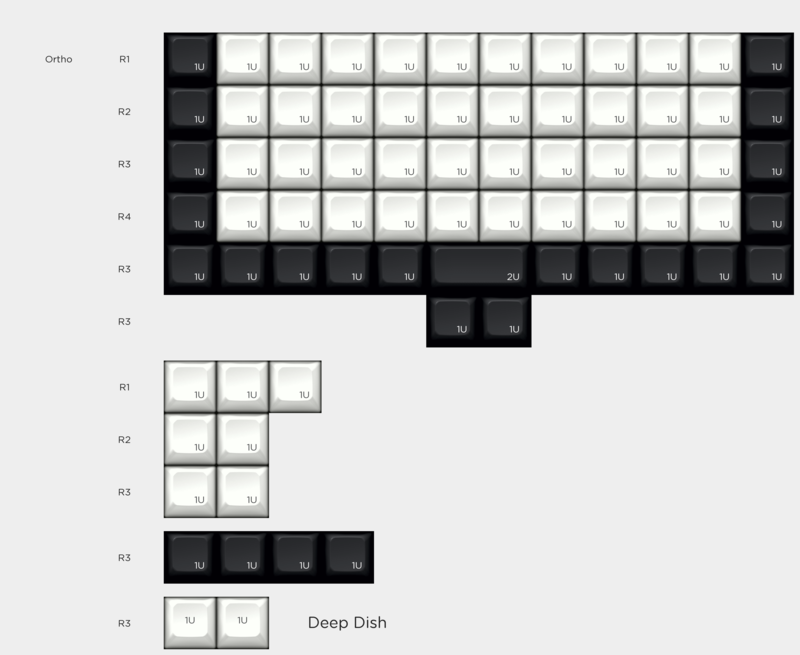 I really don't know what would entice buyers but personally I would do a 'base kit' that supports everything 60%-TKL, maybe even 104-key, and then an ergodox kit, 40% kit, and white alphas kit. I also don't know if it would decrease prices in any way but if those kits were sold in multiple colors at the same time maybe there would be more general interest - I would certainly buy at least two and maybe three depending on the price, if there were different colors. I see; I'll at least add those as 'sets': 40's, 60's, TKL, Full, Ergo, Ortho. I always thought those were annoying, since folks end up with a bunch of less useful keys... 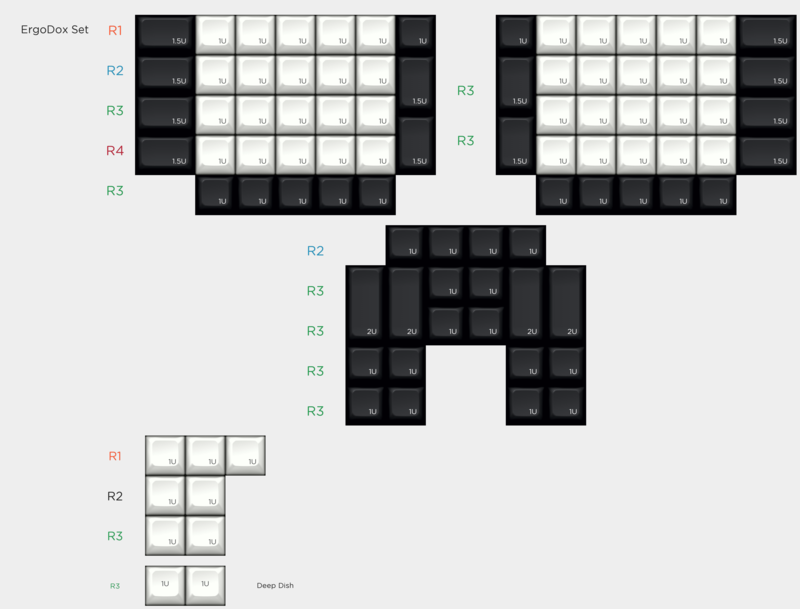 I wasn't gonna offer alpha kits at all, since I thought folks had them already from the other SA blank GB, but the IC showed some interest, so I added them. Also, adjusted the landing page on the shopify, so it's clearer about what's what. 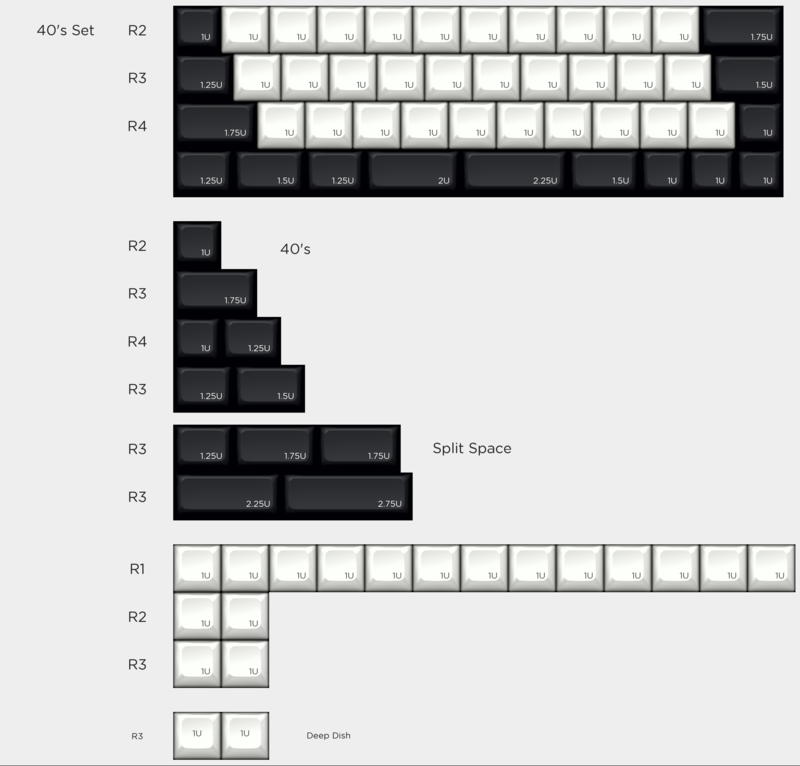 Will get 40's set, Ortho set, and Ergo set, and update the form with these new options tomorrow. Which are kits with 'all the options you need', Alphas, Std Mods, Split Shift, Split Space, WK & WKL, 6.25 & 7u spacebars. They are cheaper than ordering all kits together. They are missing the ISO Enter and Numpad. Also noticed the 40's kit was missing an R3 1u, which makes some minivan layouts impossible, so I'll add that the kits [free]. If this GB goes well, I'll offer white split space later. I have a question about the kits vs individual kits. 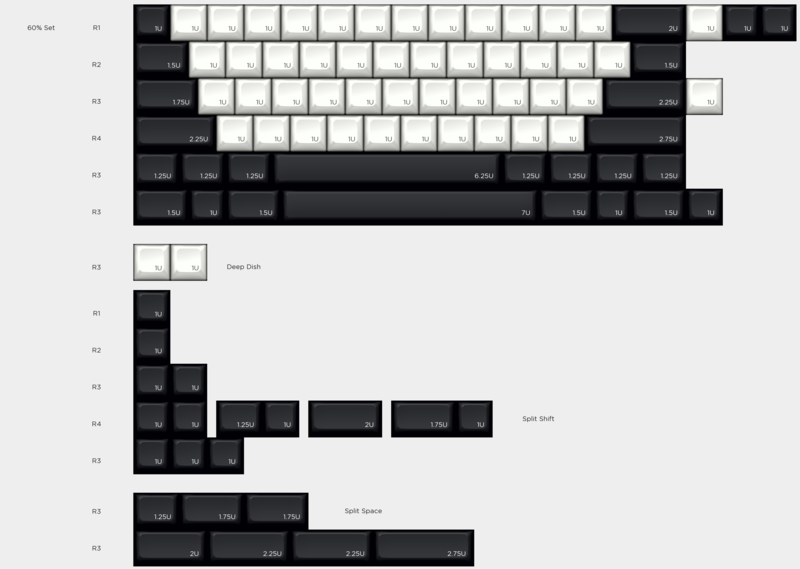 For the 40% individual kits there are colored keys (not black or white) that are included whereas the 40% kit I only see black and white keys in the renders. Is that correct? Only black / white keys are what you will get. I'll update the older images throughout the day with the new 'decals' that the sets have. more people will join if there is purple and red sets. That's what I call, a Sunday. I would say That White/Gray would get the most sales. The GB starter said he choose Black cause he wanted to. IC showed equal interest between white, gray, and black. R2 will likely be both wfk, and gd, making it Oblivion Hagoromo. I'm sure I could get more a few people, but I need 25-per-kit more people. I did some more crunching, and realized that we could lower the MOQ on the alphas to 25. We are about half way on most kits. Curious about the White set... is it only white caps for alpha num? Or is it the whole keyboard? Bump for some post holiday exposure. How much would it cost to sponsor this GB for the rest of the way? I'm keeping an eye on things; I'm willing to buy some myself for future sales. DM me if you want to help more. Are most of the kits for this being made or are still needing more kits sold? I'll go ahead and say everything will be made. The only weird thing will be the hybrid kit, which no one really seemed care about, so I'll cut it or just order 5. Interest does seem a bit low; maybe I just need to do something like Mondrian, which is just blanks anyway.... Or add some accent colors, like Modern Dolch. Or no one really cares about SA Blanks? Some accents could be nice!